Lyle: You're going to learn a bunch of scales to use against a simple jam track in E. Here's the looping jam track we'll use for the first bunch of riffs. Lyle: The scale we'll work around first is the E Mixolydian. Lyle: Now here's a 6 string version. Michael: How do you pick it? Lyle: I use alternate picking, down, up, down, up....every note. Michael: How do you hold the pick? Lyle: That riff started and ended with the major 3rd of the scale. I try to hold the pick close with not much tip showing. Lyle: Here's the next riff. Lyle: Riff 3 has the open E string droning. Again, I try and make the flatted 7th stick out. On the 3rd fret, I hold the note a bit before ending the riff. Lyle: Arpeggios are good to learn. Any chord has an arpeggio to go with it. Major, minor, minb5, Maj7#11...any of them. 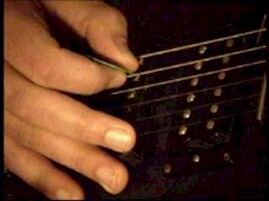 An arpeggio is made of the chord tones played one at a time. It takes time, but if you focus on a certain group of chords or arpeggios or scales, then you'll get them down better than trying to cram too much info by learning everything all at once. Lyle: Ok, now let's move on to another scale. Here comes the E Phrygian maj3rd. This is just a mode of the harmonic minor scale, starting on the 5th degree. So this E phrygian maj3rd scale is really a A harmonic minor scale. Lyle: And here's a 6 string version. Lyle: Now I've made a new looping jam track for this. Lyle: Riff 1 is simply a minor pentatonic in E, then moved up a half step to go "outside" the key.